The Car GuideNews2016 Nissan Titan XD: Affordable? 2016 Nissan Titan XD: Affordable? 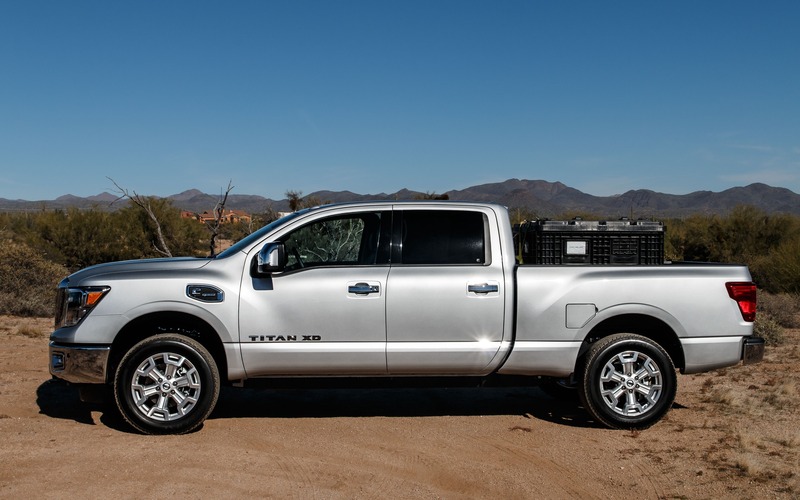 Even though the 2016 Nissan Titan XD got a lot of good comments on its style, its off-road performance and its towing capabilities, a question remained: how pricy would it be? Would it be affordable, or would its price be so high that only the wealthiest could afford it? It seems like the truck will have an interesting entry point: a base-model, Titan XD S Crew Cab 4x4 will start at $52,400. It’s less than a similarly-equipped Ford F-250 with a Powerstroke… but not quite as capable. The XD SV is set at $56,300: for that price, you get the Nissan Connect system displayed on a 5.0-inch screen, as well as a gooseneck trailer hitch in the bed and trailer sway control. At the top of the range sits the Titan XD SV Platinum Reserve. For a price of $73,900, you get a fully equipped luxury truck with heated and ventilated captain’s chairs covered in premium leather, a heated steering wheel as well as a 360-degree camera system. Regardless of the version, every Titan XD comes with a 5.0-litre Cummins engine developing 310 horsepower and 555 pound-feet of torque.